There's something about pairing beef with stout that creates flavours even greater than the sum of the parts. 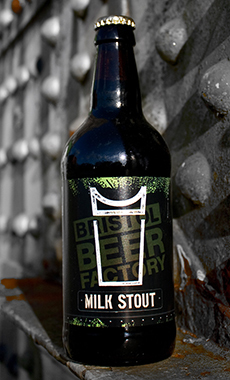 Bristol Beer Factory's Milk Stout is a delicious example of the style, with some lovely sweet roasted coffee and chocolate flavours. 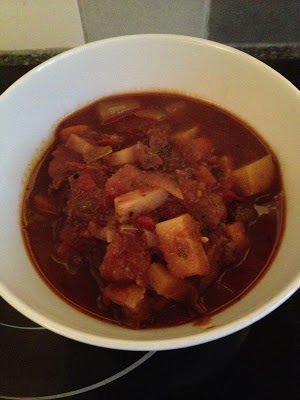 I thought I'd try it in a beef stew and well, it turned out really nice so I'm sharing the simple recipe. Heat some oil in a large pan on a medium heat and throw in the leek, onion and garlic. Cook gently for 5 minutes then add in the carrots, parsnip and swede for a further 10 minutes, stirring frequently (the aim is soften, not brown the veg). Remove the veg and set aside. Up the heat a bit and add more oil to the pan. Brown the beef until sealed then add the flour to soak up the oil and juices from the beef. Add the veg back in along with the tin of tomatoes, stirring as you go. Pour in the bottle of stout and fill the tomato tin with water (about 400ml) and add that in too, crumbling the stock cube in while stirring. Finally, add a pinch of salt, a generous twist of pepper, a teaspoon of cumin, the bay leaves and chilli to taste. I used dried chilli but fresh will be fine. The aim is to just bring a little warmth rather than end up with a spicy dish, so go easy on it. Bring gently to the boil then turn the heat down to a simmer and cook gently for 2 hours. Like most stews, if you can resist temptation, allowing it to rest overnight and re-heating the next day really allows the flavours to meld together. Serve hot with a fresh crusty roll for mopping up the juice and of course, another bottle of Bristol's finest!